HAPPY NEWS!! 10 days ago our baby girl was born, who we named Yolanda. Our home is filled with love and happiness as we welcome this new soul into our lives. I was very much in the mood for a soft, hearty, flavourful dahl full of good stuff, and so ended up with this very tasty and warming stew for the cool nights we've been having! Marinate the tofu cubes in curry oil and set aside. Place the lentils, turmeric, salt and water in a medium sized pot and bring to a boil. Stir in half the tomato plus the squash, cover and cook on medium-low until cooked, about half an hour. When done stir in spinach. Meanwhile, heat oil or ghee in a large, deep pan and add spices (mustard seeds, cumin, coriander, chili). When mustard seeds start to pop, stir in garlic, ginger and onion. Stirfry a few minutes, then add tofu cubes. Continue cooking til tofu is lightly browned and onions are cooked. Add a bit of sea salt if desired, plus half the chopped cilantro. Set some of the tofu mixture aside, then pour cooked dahl mixture into the tofu pan, stirring in a bit more water if you like it a little soupier. Serve with rice and top with reserved tofu, tomato and cilantro, plus any sides you like. Serves 3-4. I continue to enjoy your recipes. You are most inspiring! Take care of yourself and that little girl of yours! congrats!!! enjoy each moment with her! 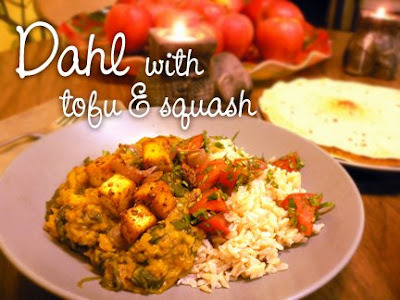 Daal and tofu is wonderful.....very comforting. Hola Marco, sí, soy Chilena -- y tú también? Gracias por visitar mi site! Hola Fran, si también soy chileno, q weno q estay "spreading" la ayurveda a traves de la comida, buena iniciativa. Mira, tengo una duda acerca del arroz basmati(el blanco no el integral), q ventaja tiene el basmati sobre el arroz blanco?, te lo pregunto porque al ser los dos "blancos" significa q ambos son productos refinados, pero al parecer el basmati tiene cualidades y propiedades distintas al arroz común, sabes algo al respecto? I'm going to answer your query in english so that other readers can benefit from this info... :-) The question is, what's the difference between white basmati and plain white rice, and why is the basmati recommended by Ayurveda? Paraphrasing from A Life Of Balance, white rice has bran and germ removed, and is milled and polished, often coated with glucose and vegetable oil, and needs to be fortified with vitamins since its innate nutrients have been stripped during processing. Basmati rice is considered sattvic, easy to digest, cooling to the digestive fires (therefore best for Pittas and generally eaten during warmer seasons), and is held in high regard Ayurvedically as a cleansing and healing food for all body types. Although it has the bran and germ removed, brown basmati does not and therefore has greater healing properties, and as well is also more heating and grounding while still being a highly digestible grain. I'm planning to make this for dinner in the weekend. I think I'll try to shoot it, but I don't think it will be as pretty as your picture! I absolutely love everything about this site! I am very new to ayurveda (basically still in the research phase) but I have found many recpies here that I cannot wait to try! I was wondering if you know where I might find a list of basic essentials for ayurvedic cooking? I've noticed that alot of the recipes have similar spices and things and I wasn't sure if there might be a "Getting Started" list or something like that for newbies to stock a kitchen with? Any feedback would be greatly appreciated, thank you! Thanks to the last comment! Making a "getting started" list is a great idea, maybe I'll try to post one soon :-) Meanwhile, some things depend on your dosha, so it might be helpful to find out if you are predominantly Vata, Pitta or Kapha, and go from there. You'll find lots of help if you just google "food for Vata", for example. Meanwhile, here are things every Ayurvedic kitchen needs!